This walk takes you from the waterfall car park via a stile into the lush green fields where sheep graze. Yellow way-marks guide you via other stiles and gates to the tree lined banks of a stream. Some of the oldest sessile oak trees in the park are on this walk. The base of a famine road can be discerned. A stroll through the well-managed pastures brings you to a field on to the road near the main bridge. The remaining section of the walk is up the road. On your right is a dry-stone wall, no mortar was used, built during 2005. Much of the stone was re-claimed from the derelict wall and some was collected from the steams. Half-way along here is a seat built in to the wall that makes a good photo opportunity with the waterfall in he background. The road leads uphill to the farm buildings which are still used so keep an eye out for sheep and their lamps in spring. The road becomes steeper as it follows the stream on the left which is a series of wonderful rock pools where some take a refreshing dip on hot days, there are picnic tables here. You could stop at the Water Garden on your left as you leave the farm-building road. This is a lovely spot to have a picnic. This starts from opposite the reception car park. A narrow path runs alongside the river towards The Water Garden. The two ponds swarm with tadpoles in the season and water lilies grace them in the summer. The walk follows the stream, a delightful series of rock pools and cascades of unusual design. There are handrails, steps and bridges, (all hand crafted on site from timber on the estate). The wooded area is home to several species of tree, wild flowers and fungi. Pied and Grey Wagtails also Dippers frequent the fast moving stream.. The walk ends at a gate opening onto a track that leads up into the mountains or back down to the farm and reception. The path along the river can be slippery at times so do take it steady. Beginning in the waterfall car or from Reception park the trail takes in most of the lower valley and crosses the twin streams by the bridge and enters the woodland enclosure. The trail ascends the wide track until the sign for The Heritage Trail indicates the path down into the valley which crosses the stone bridge. Soon after the bridge there is a walled enclosure that once served to protect drying crops and called a ‘haggard’. Leaving the enclosure and crossing a small stream brings you to the Heritage Site, an 18th Century farmstead, uninhabited for more than 130 years. There are two buildings within an enclosed yard. The covering of vegetation and soil was removed and the walls cleared during 2005. One of the buildings was renovated and a thatched around 2009. The Famine Cottage has featured in various films and magazines, Vogue, with Annie Liebowitz 2013, Elle in 2016. In 2016 a UK film Company spent 6 days shooting a short film, ‘The Widow’s Last’ depicting a woman’s struggle with life in Famine times. Before it descends to the footpath there is a sign Viewing Point which leads to a view down the valley to the sea over the top of woodlands. The footpath resumes just beyond the gate back into the enclosure and descends to the stream. A wooden bridge crosses above a beautiful series of waterfalls and pools right on the boundary of the park into a small field. The field gate gives access on to the road leading back into the park and car parks. Beginning at the waterfall car park the trail crosses the twin streams at the base of the falls by bridges or fords. The wide track ascends up the mountainside through a woodland enclosure and ends at Cummenadillure, a deep black lake in a coombe. Halfway up, on the right is a path descending to a steam crossed by a stone bridge, this is the Heritage Trail. The Famine Cottage there has been carefully restored to its former glory. At the lake the trail steepens and takes a right turn over a stile in the high fence. The next section is up the rocky mountainside following the white and red way marks to the top. There are signs at the top marking the start of Trail No 4 marked with yellow and one pointing to a Viewing Point. It is worth taking the short detour to see the upper valley with Lake Cummenaloughaun in its centre. The trail descends to the top of the waterfall which is crossed by a log bridge. The heavy logs were flown up to their location by helicopter when opened to the public. The ever changing vistas of the valley with its lakes descending to Kenmare Bay and the McGillycuddy’s Reeks in the distance is a memorable experience. There is a bog area at this point and the method of harvesting the turf or peat can be seen. The white and red way marks lead to a flight of steps cut in the rock that lead down off the mountain on to a wide track. Halfway down, on the right is a picnic area and charcoal pit. Towards the bottom there is a wooded area and a small wooden gate opens into the delightful River Walk making a nice contrast to the rugged mountain trail. There is another picnic spot near a small waterfall. Please note that this walk not suitable for young children. The path starts from the car park and follows the Red Route towards the top of the waterfall then turns right. 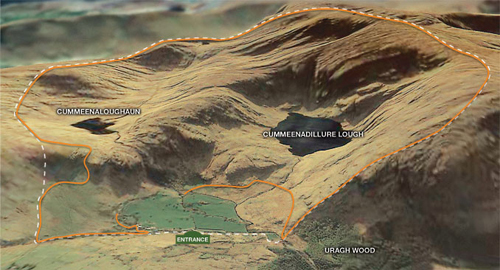 The Upper Valley walk then follows the rim of the valley making a complete circuit around Lake Cummenaloughaun. There are no footpaths, follow the yellow way marks. If the lake is kept in sight to the left you will be fine. There is real feeling of wilderness and as only a small percentage of our visitors take this walk those that do have it to themselves giving a wonderful sense of complete isolation. The descent back to the farm is via the flight of steps to the right of the falls. Hand rails give added reassurance as the descent is quite steep. Do not miss the River Walk at the end of your excursion, this is a delightful finish to your walk. Please note that this walk not suitable for young children and is for experienced hikers. 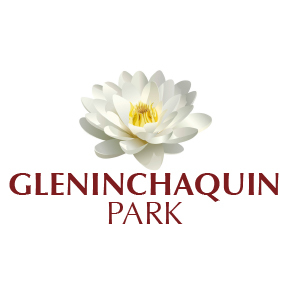 The route follows the boundaries of Gleninchaquin Park which are defined by the high ridges of the Caha Mountain Range, starting with the Western ridge above the Heritage Site. This walk has to be experienced to be appreciated. A number of walking groups come each year for the experience sometimes combining it with another day walking the Beara Way which passes close by.